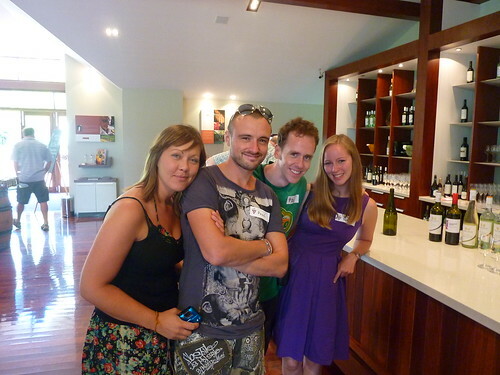 There are umpteen wine tours on the west coast, mainly because there are umpteen vineyards. The most famous are the Margaret River and Swan Valley tours, and we decided a half-day tour with the latter looked the best value, backed up by Rob and Fi's recommendation. They said that a half-day was enough; the full day started at 9:30 and neither of us wanted to start drinking that early, especially when you can still taste the toothpaste. Setting off at 12, we bundled into a minibus with 5 other people who had already been to two wineries in the morning, and headed over to Houghton winery. 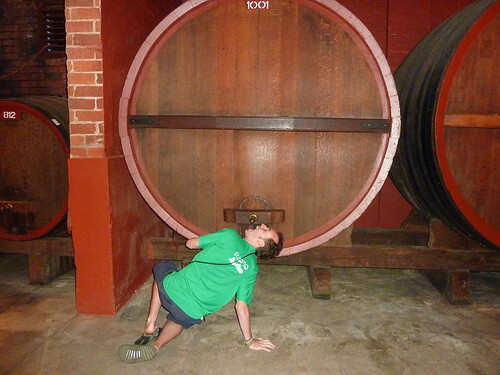 This was one of the more commercial wineries in the area. The host Steph poured us 5 wines to taste here. The last white was a little sweeter than I prefer, but had a nice vanilla taste and would probably go well with curries. I've never really been a big Chardonnay fan, and it tasted like every other Chardonnay I've had, but the White Classic was excellent. 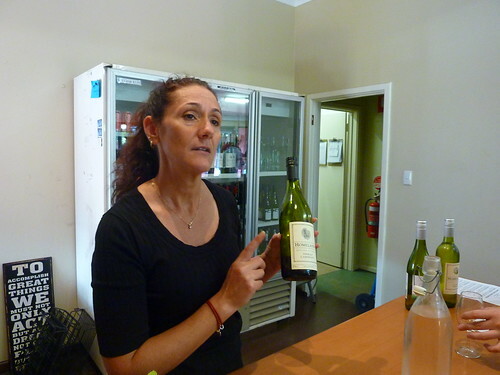 We were also given a 2010 Shiraz from the stripe range, and a 2009 Cabernet Sauvignon from the Moondah Brook brand. Both were nice but I wasn't blown away by either. Unfortunately the barrel was empty so I had to leave. 1. 2010 Hartley Classic White - similar to the Houghton White Classic but with Viognier thrown into the mix. 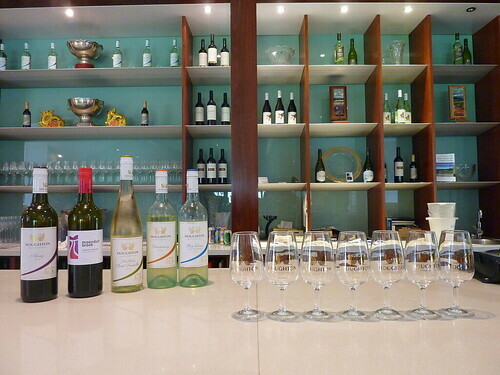 The rose wines were great, and I was surprised to find I enjoyed the sparkling Shiraz which was served chilled. I'm not sure what it says about my palate, but I much preferred the cleanskin Shiraz to the Reserve Shiraz Viognier which is 4 times the price... As Rob and Fi mentioned they also enjoyed the wines here, we bought a mixed case of 6 Hartley Classic White and 6 Rose to take back with us. The port was really interesting, as they also gave us a chocolate covered coffee bean to eat after first trying the port. The taste of the port completely changed once we'd eaten the bean, and tasted like a completely different (but still delicious) drink. I generally prefer whisky and brandy to port or sherry, but this was lovely. 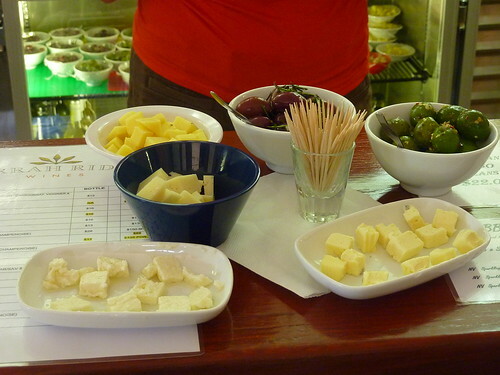 They also put on a cracking selection of cheeses and olives to eat with the wine. My dislike of olives was, alas, not tempered by the chilli and garlic marinades they had dunked them in. I guess I'm just not an olive person. The garlic goat's cheese was excellent though, and I'm not usually a fan of that either. The Shiraz Cabernet was very light, whilst the Shiraz was medium bodied but very peppery and I really wasn't keen on the Cabernet Merlot. The whites were nice enough but not as good as the ones from the previous wineries. The last two wines served were from the winery's unique "Bambino" range, which were Bianco: a sweet Chenin Blanc that tasted like punch and which the winery made ice pops from, and Rosso: a very sweet Shiraz which seemed to have been developed specifically to chuck into sangria. Neither were wines I was interested in trying again. 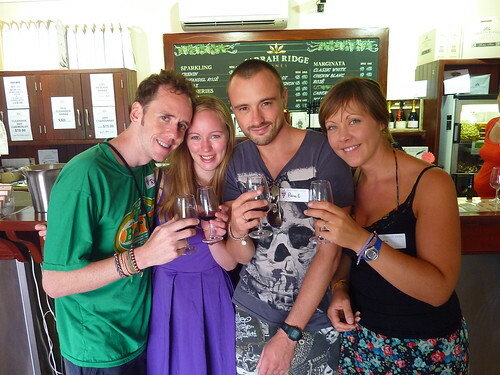 The tour also included a trip to the Mash Brewery, which was the next stop. We were given a complimentary schooner of beer or cider (I went for the latter), followed by a basket of things to nibble on, including the best chorizo I've ever eaten. Note:- in Australia a schooner is basically a half-pint and usually costs the same, if not more, than a pint in the UK. A lot of bars only serve schooners, which is a great way to make money and piss off hard-up backpackers at the same time. 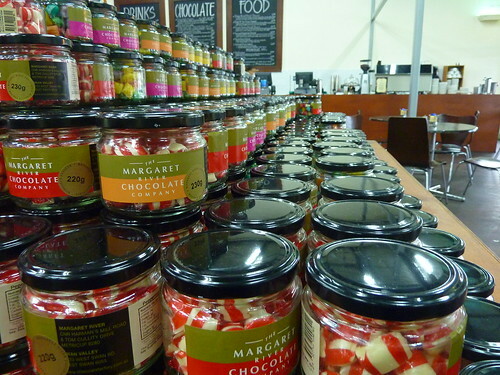 The final destination of the afternoon was the Margaret River Chocolate Factory. 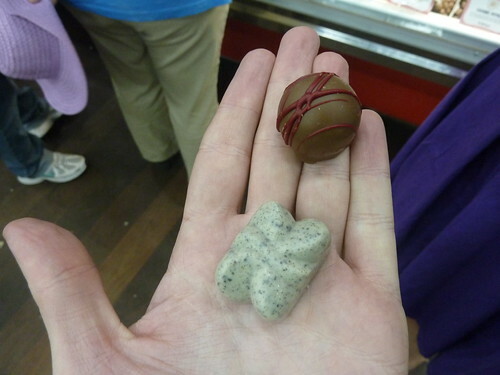 We were given a single truffle each (they usually retail at something ridiculous like $6 a piece). I went for cookies and cream whilst Gilly chose some sort of raspberry concoction. They were not terribly exciting. 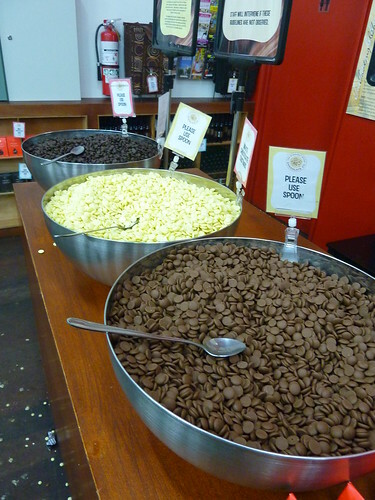 What was exciting were the three huge bowls of milk, white and dark chocolate buttons sat by the entrance. 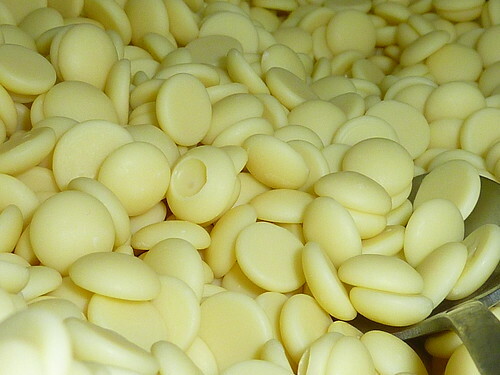 You could scoff as many of these into your fat face as you wanted, so we did. The factory doesn't have a Willy Wonka-style eccentric owner, but it does have an impressive array of pricey sweets, should you want a memento of your visit. Hauling our case of wine onto the bus, we were grateful to Fi picking us up at a bus stop close to their place and then cooking up some cracking fajitas. More wine was drunk; we obviously hadn't had enough earlier in the day. Needless to say, we slept pretty well that night. nice post. i've just realised your profile reads as if you're only dating gilly for the year that you're travelling round the world. 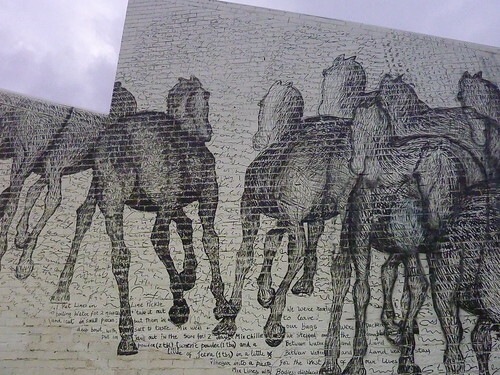 have you discussed this awkward end to your trip in much detail yet? No, I'm hoping not to draw too much attention to it; for instance, by her reading comments in the blog suggesting this.